Microneedles almost too small to be seen with the naked eye may offer the best way to treat glaucoma and corneal neovascularization, two of the world’s leading eye diseases. The microneedles range in length from 400 to 700 microns and could provide a new way to deliver drugs to specific areas within the eye relevant to these diseases. By targeting the drugs only to specific parts of the eye instead of the entire eye, researchers hope to increase effectiveness, limit side effects, and reduce the amount of drug needed. Glaucoma affects about 2.2 million people in the United States and is the second leading cause of blindness worldwide. The goal is to develop time-release drugs that could replace daily administration of eye drops. A painless microneedle injection made once every three to six months—potentially during regular office visits—could improve treatment outcomes by providing consistent dosages which could overcome patient compliance issues. In the second disease, corneal neovascularization, corneal injury results in the growth of unwanted blood vessels that impair vision. To treat it, researchers developed solid microneedles for delivering a dry drug compound that stops vessel growth. “The power of microneedles for treating eye conditions is the ability to target delivery of the drug within the eye,” says Mark Prausnitz, professor in the School of Chemical and Biomolecular Engineering at the Georgia Institute of Technology. Research for two studies, both published in the journal Investigative Ophthalmology & Visual Science, was done using animal models—and could become the first treatment technique to use microneedles for delivering drugs to treat diseases in the front of the eye. The first study shows that the microneedle therapy would inject drugs into space between two layers of the eye near the ciliary body, which produces the aqueous humor. The drug is retained near the injection side because it is formulated for increased viscosity. In the animal model, researchers were able to reduce intraocular pressure through the injections, showing that their drug got to the proper location in the eye. 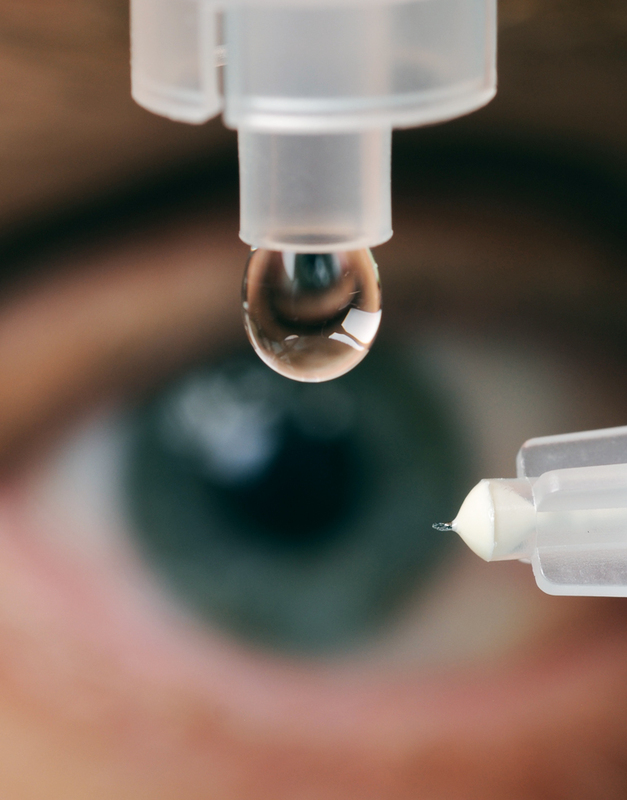 Because the injection narrowly targets delivery of the drug, researchers were able to bring about a pressure reduction by using just one percent of the amount of drug required to produce a similar decline with eye drops. The researchers hope to produce a time-release version of the drug that could be injected to provide therapy that lasts for months. For the second study, researchers took a different approach to treat corneal neovascularization. They coated solid microneedles with an antibody-based drug that prevents the growth of blood vessels and then inserted the coated needles near the point of an injury, keeping them in place for approximately one minute until the drug dissolved into the cornea. In an animal model, placement of the drug halted the growth of unwanted blood vessels for about two weeks after a single application. While the research reported in the journal did not include time-release versions of the drugs, a parallel project is evaluating potential formulations that would provide that feature. The National Eye Institute of the National Institutes of Health supported the research. Hans Grossniklaus, professor of ophthalmology at Emory University contributed to the study. Yoo C. Kim, Henry F. Edelhauser, and Mark R. Prausnitz hold microneedle patents, and Mark Prausnitz and Henry Edelhauser have significant financial interest in Clearside Biomedical, a company developing microneedle-based products for ocular delivery. This potential conflict of interest has been disclosed and is overseen by Georgia Institute of Technology and Emory University.